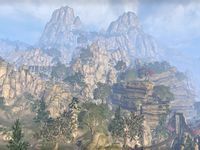 Eton Nir is the tallest mountain in the Summerset Isles, and houses the city of Cloudrest, which is at the top of the mountain. In a grotto beneath the mountain's foundations, a shrine to Meridia was built by a group of her worshippers. King's Haven Pass and the Crystal Tower could be found in the mountains north of Eton Nir.